Kinderhula is an instructional program of Polynesian dance and culture. Kinderhula is a registered trademark. All rights reserved. Hula is a lifestyle. I am also director and instructor of 'Ohana Arts & Hula Studio and Polynesian Dance Studio. Hula is my life. We are based in the Hampton Roads region of Virginia. Our studio offers demonstrations, performances, lessons, parties, and special events. Ha'aha'a (humility) is an important Hawaiian value to me. However, I offer my bio as a means to educate others about my background. Aloha. It gives me great honor to perpetuate my culture. I was born and raised in Hawaii. I am Chinese, Hawaiian, Caucasian, Morrocan, and Portuguese. I started dancing hula at age four. I also danced traditional Portuguese dancing for 2 years as a child. I also currently enjoy salsa dancing and belly dancing. 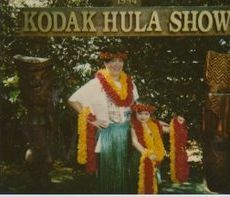 I have been teaching hula since 1991 which is when my oldest daughter was born. Initially, I started by passing on the hula tradition to my children and then now to my students. This is the Hawaiian way. My roots are from Hawaii. I am a real island girl. I continue to visit my island home and keep in touch with my family and friends. I also learned hula at the YMCA located in Waialae-Kahala with Lila Replinger. She was a professional hula dancer and musician. She chose me, my sister, and my cousin to become her students in the Hawaiian tradition and taught me hula. Then I continued my hula and cultural training throughout high school at Kamehameha which is a school for the education of Hawaiian children and then into adulthood. We are an 'ohana (family) based studio. All 5 of my children play ukulele and dance. I have taught all of my children how to Polynesian dance since they were 2 years old. Makanamaikalanimai ("my gift from the heavens" or "my gift from God") is 17, Mahinaokalani ("heavenly moon") is 14, Kamehanaokala ("warmth of the sun") is 10, Kekaimalu ("peaceful ocean") is 5, and Kealani ("heavenly white") is almost 4. My oldest 3 daughters are student teachers and performers. Hula is our legacy and we operate our studio family-style which is the Hawaiian way. My great-great-great grandfather is Augusto Dias. He is one of the three men who are credited for what is now known as the 'ukulele in the islands. He was inducted into the Ukulele Hall of Fame in 2003 by the Ukulele Hall of Fame Museum. He was "among those who entertained King David Kalakaua in the royal bungalow on the grounds of Iolani Palace." After graduating from Kamehameha in 1985, I attended the University of Hawaii at Manoa and then I moved to Seattle, Washington in 1986 to attend college. In 1997 I moved to Oklahoma due to my husband's career. From there we moved to Hampton, Virginia in 1998. I now make my home in Newport News, Virginia and travel to the Baltimore/DC area regularly. - I worked in the tourist and airline industries in Hawaii. I was employed at Pleasant Hawaiian Holidays (now Pleasant Holidays) as a sales representative, stores in Waikiki, as a lei maker, a service representative for American Airlines, and then as a reservation and sales agent for Hawaiian Airlines.